Hello! Another Corrosive Challenge is upon us and we have a fabulous new sponsor for you with Dilly Beans! 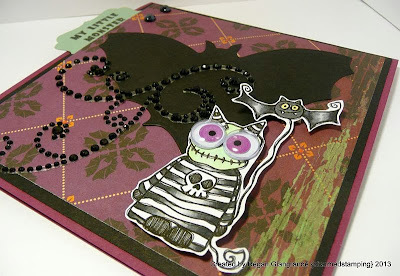 They have a plethora of cute and creepy images so why not make that our theme this fortnight? With Halloween on the horizon this promises to be lots of fun! I must admit that I spent all day putting up my Halloween decorations (with a bit of cleaning thrown in) and neglecting my crafty duties. 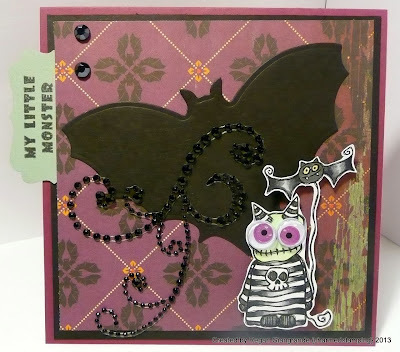 But I did finally manage to get this little guy, Little Monster & Bat (478), colored up and onto a card. 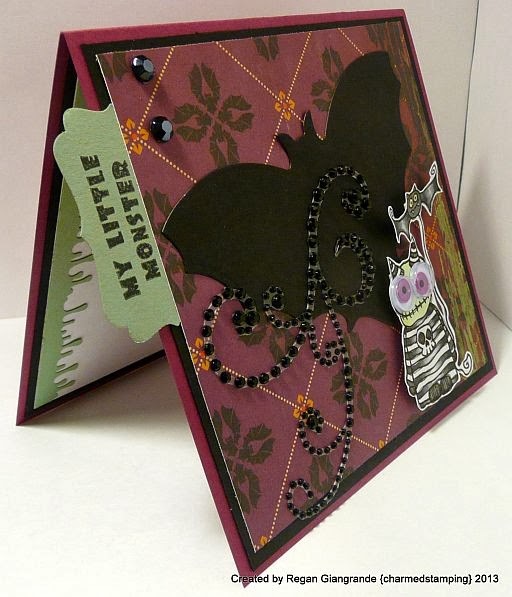 Paper is from the Cosmo Cricket Haunted collection. I used a Spellbinders Bats die, a Stampin' Up punch, and added googly eyes plus a bit of bling. The sentiment is from Recollections. I will most likely give this to Kayne. 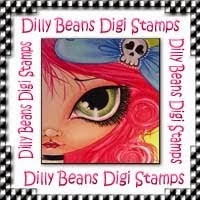 Want a chance to win 3 Dilly Bean images? Show us your creepiest and cutest creations over at The Corrosive Challenge blog! And while you're there be sure to admire the team's amazing work! They are much more inspiring than I am today! My mojo seems to be MIA at the moment. Maybe coffee will help. It's mocha pumpkin spice... Sounds promising! Have a wonderful day and thanks for stopping by! Markers used: Copics (YG11, BG0000, N0, N2, N4, N6, N8). Totally awesome - love the googly eyes! :) Thanks for joining us at Dilly Beans, my friend. Fun card Regan and als cute and creepy. Love what you did with the larger bat and the image. Great ideas and design. Love the black bling.